On Wednesday 1st July 2015, I finished teaching for the day and I noticed a missed call on my iPhone. It was from my former teacher Michael Laird. I called him back as I walked to the railway station and he told me, now that he had turned 75, he would be retiring from trumpet playing entirely. He explained that he had played since he was 15 years old and now, 60 years on, it was time to stop playing and to start retirement. 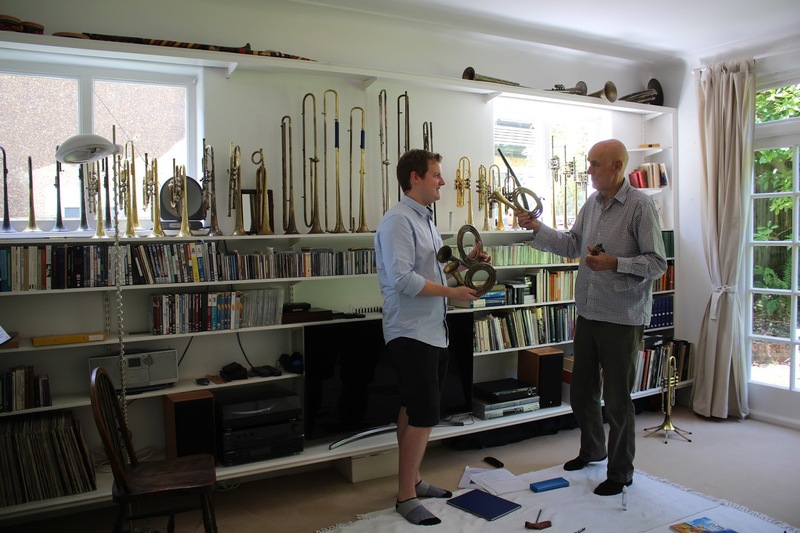 Studying for a Masters at the Royal College of Music in London (between 2010 and 2012), Michael Laird took the role of my principal study (natural trumpet) teacher. I went to his house in Wimbledon for my lessons and I played natural trumpet, keyed trumpet and cornetto to him on numerous occasions. I always came away with a renewed sense of confidence and with a fire of ambition that had been well and truly stoked. He found ways to give me confidence, even when I was over-critical of myself. Sometimes I would arrive feeling a little downhearted or despairing of my progress. I would be wondering what to do next or where the next stroke of inspiration might come from. In one way or another, it always came from Michael. He might have played a CD, opened a manuscript score, given me a practice technique, read out an extract from a book or given praise and encouragement when it was deserved. When these things came, they always hit the nail on the head - the right teaching device at the right moment. His infectious enthusiasm and remarkable knowledge of all aspects of trumpet-playing is incredible. I always left his house with a head full of ideas (even though Michael would often over-modestly say “Russell, I don’t think there is very much I can teach you”) and with the enabling feeling that Michael seemed to be able to initiate. As time went by, Michael would pick up a book and say “take it away and have a look at it, and bring it back when you’ve finished with it”. What started with books ended up being instruments, and Michael very kindly allowed me to borrow three of his instruments while I was a student. He had said to keep them for as long as I liked. I practiced on these instruments for a while - maybe a year - and I returned them before my graduation in 2012. I had really enjoyed playing them and I thanked Michael for allowing me to use them during my time as his student. During the telephone call, Michael invited me over to his home in Wimbledon. I was doing a concert in Kingston on Saturday 4th July 2015 so he recommended that I came over before that. Michael told me that he wanted me to have three of his instruments. Michael gave me three H. Finke coiled trumpets - one in C, another in D and the final one in F. Michael had played these instruments with players like Iaan Wilson, John Wilbraham and Philip Jones in the early days of the natural trumpet revival (around 1960s and 1970s onwards). They called them the ‘Clarini trumpets’ in lieu of any other name really. The F trumpet is the oldest of the three instruments and that had previously belonged to one of Michael’s teachers, Walter Holy (from the West Deutscher Rundfunk orchestra in Köln) - the inventor of the three-hole system. It was a real honour to be given the three H. Finke coiled trumpets by Michael. They are from a very important chapter of the natural trumpet’s history and I am privileged and honoured to have the use of them. I have already had a great deal of enjoyment from playing on the instruments. I took the F trumpet on tour with me to Poland, as the conductor had asked me about the possibility of Telemann’s ‘kurztrompete’ being a coilled instrument. I think it just means short trumpet, as the name literally translates, however it was great to be able to offer a choice between using a straight trumpet and using a coiled trumpet. The orchestra I was playing with there has a full-time archivist who is an excellent photographer and he took something of a shine to the coiled trumpet. He asked me to stand in front of some original 18th century wallpaper in the castle in ‘Brzeg’ - so that he could compose the photograph so that my head would be framed within the symmetrical pattern of the wallpaper and so that the vines could lead out of the bell of the instrument. 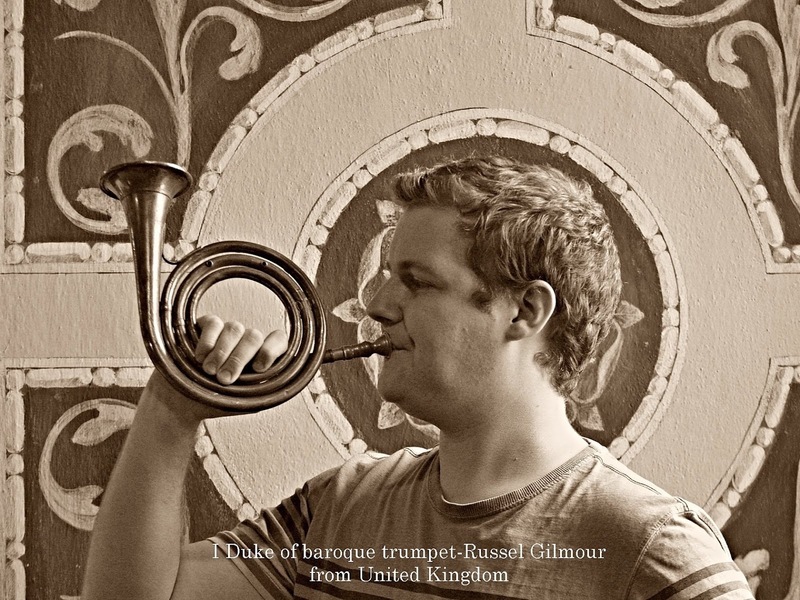 He then posted it online and labelled it ‘I Duke of Baroque Trumpet - from United Kingdom’. I would argue that it is Michael Laird that absolutely holds that title. His work within the trumpet playing world has been incredible and inspiring. I later wrote to thank Michael for the instruments and for all that he had taught me while I was at the Royal College of Music. I thanked him for the inspiring lessons he gave me and for the fantastic example he has set within the profession - even in the short time that I have known it. I also thanked him more generally for introducing the natural trumpet to so many people around the world. Wherever I travel, I hear people talking of Michael Laird in the highest regard - and rightly so.